Arcam has finally released issued full details on its new loudspeakers - the Muso satellite speaker and Logo active subwoofer. The Muso satellite speaker and Logo active subwoofer are designed to accompany Arcam's acclaimed Solo hi-fi and Solo Movie home cinema systems. 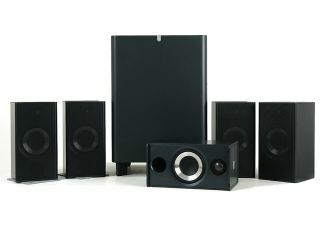 They can also be used to accompany any other hi-fi or home cinema set-up. Both the Muso and Logo are the result of two years' research and development from the Cambridge, UK based firm. They also take the company into uncharted territory - it's never made its own speakers before, preferring to concentrate on hi-fi and AV sources (CD, DVD players) and amps or receivers instead. The Muso satellite speaker is a 2-way design that combines the latest in woofer and tweeter design and an 8-way crossover into a damped aluminium and steel cabinet. The result is a speaker that "offers a bass performance far beyond that of a typical satellite design and when placed close to a wall offers superb music performance on its own," according to Arcam. Again the Logo sub has been optimised to deliver the best sound quality without forcing you to compromise on placement. It can deliver up to 200W of deep bass oomph with frequencies as low as 35Hz.